1. Add peeled eggs, salt, sugar, beets with juice, onion, fresh dill and garlic to a quart sized mason jar. 2. Fill to top with apple cider vinegar (about 1 cup). 3. Seal the jar by just hand tightening the lid then very gently shake to distribute the ingredients. 4. Place jar in the fridge for at least 24 - 48 hours to allow flavors to absorb into the eggs. That's it! Your pickled eggs and beets are then ready to enjoy! Unless you’ve visited Amish country recently, you may have thought pickled eggs are a thing of the past. Not so! Amish Pickled Eggs and Beets are a great snack, an easy breakfast on the go, and they’re delicious on a salad. So many things can be pickled! In case you haven’t noticed, lately I’ve been quick pickling ALL THE THINGS. Eggs, red onions, cucumbers, carrots, tomatoes, you get the idea. It’s a great way to preserve things since pickled foods last much longer thanks to the natural preservatives used to do the pickling. Namely vinegar, salt and sometimes sugar. Pickling food is actually fun! I don’t know what it is exactly about pickling, but it’s addicting. Like almost as addicting as Pinterest, chocolate and reality TV shows (Have you seen The Profit??). I don’t do any of that fancy canning stuff that involves sterilizing, boiling and other things that involve effort. No, friends. Refrigerator pickling is the way to do it, r-e-a-l lazy style. You literally just have to put things into a Mason jar, put the jar in the fridge and wait. The longer you wait, the more flavorful the food, eggs in this case, but you can eat them as soon as the next day or even within a few hours if you’re really anxious. Pickled eggs look weird but taste so good! If you read my other recipe for Amish Yellow Pickled Eggs, you will know that the Mr. loves pickled eggs and until recently I thought they were a little… weird. Then the universe as I knew it, flipped upside down and revealed to me how much better eggs can be with a little flavor-flave. So, the question I have for you is, are you willing to travel down this road of pickling things, specifically eggs? I’m assuming you are if you’re here so that’s good, very good. Trust me on this, it’s going to fun and easy. So, com’on, let’s pickle things in Mason jars like our great grandparents used to and then sit on our front porches with our lemonade and enjoy a little pickled egg and beet snack! Whaddaya say? You will need a few special things for this recipe: a quart-sized, wide-mouth Mason jar and this is optional but I prefer the plastic caps since the metal ones get rusty after awhile. Also key is pickling salt. After a little research, I discovered that the iodine in regular table salt can affect the flavor and can cause cloudiness. These are refrigerator pickled eggs. No canning involved. 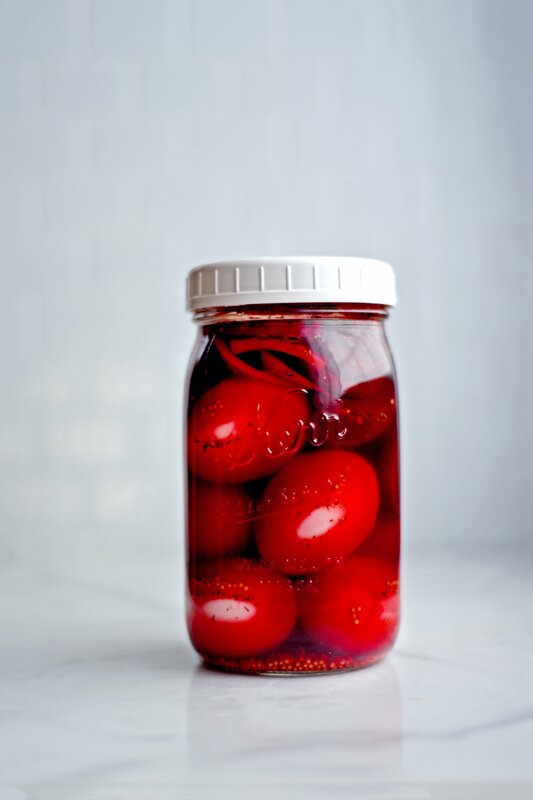 This recipe is for refrigerated pickled eggs. I don’t do any long-term, sealed, sterilized canning at this point. Too much trouble. But if you’re into that, I guess you could use this same recipe and take that extra step. Then you could even wrap them up for your next gift exchange! This is a shortcut recipe using canned beets. Since my recipes are geared toward busy people and families, I try to incorporate at least one short cut in all my recipes. This recipe’s short cut is using canned pickled beets. However, you can use fresh beets. All you have to do is peel, slice and boil your beets in enough water to just cover them for 15 minutes or until they’re soft. Then use those beets and the beet water as your starting point. We grew beets in our garden this year and used this method. It worked great! However, if you don’t have access to fresh beets or have the time to process them, then a can of pickled beets will work just fine. 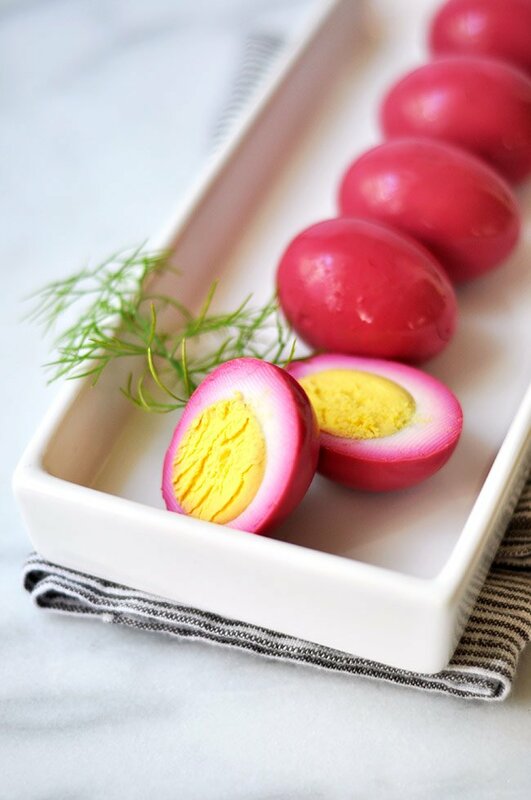 If you like these pickled eggs and beets, then you might want to also try my yellow mustard pickled eggs! 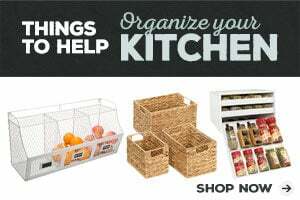 You can also browse all my recipes too while you’re here. 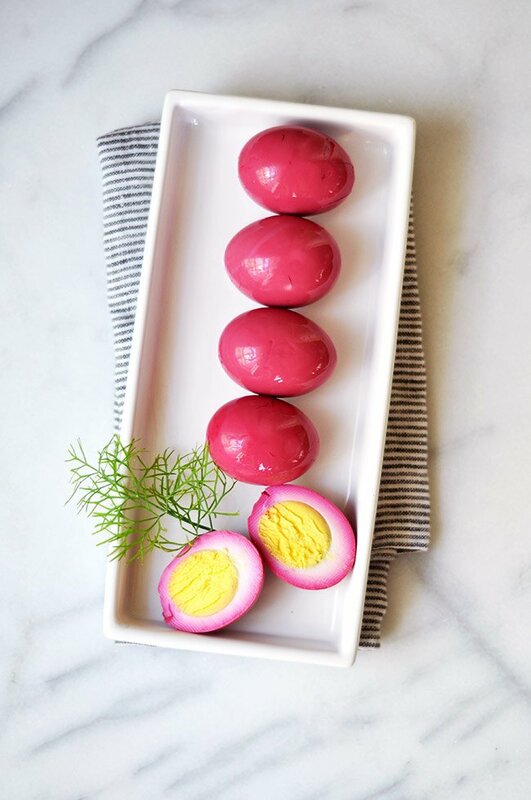 This Amish pickled eggs and beets recipe was featured on Sew It Craft It Cook It!